Crash testing is essential to ensure passenger safety. 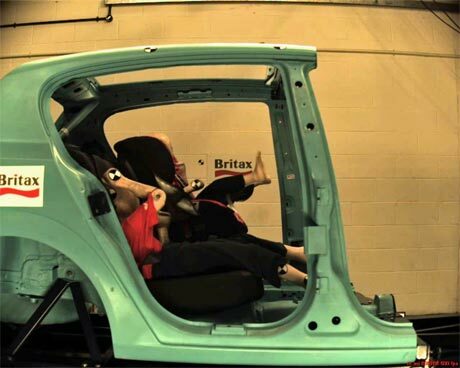 The Britax Excelsior crash testing facility at Andover (UK) has two tracks which it uses to test its car and aircraft seats. When Britax conducted a major upgrade to its facility, Windmill Software was closely involved. In order to provide calibration and online viewing of the output from accelerometers, Windmill produced a driver for the Microlink 580 transient capture card that Britax was already using. This meant engineers could now view readings in the Windmill DDE panel. Windmill also modified their Brake Testing application to provide a front end software package that allows the operator to select a particular type of test and dummies to be used. These are associated with particular sensors so that calibration data for each sensor is automatically passed to the analysis program (FAMOS). FAMOS can then give accurate readings of acceleration in g (grav). The setup of the test, data collection during the crash, and analysis according to the test selected are all processed through the Windmill front end software. This maintains records of each test carried out, together with storage of raw data files for later re-analysis if required. FAMOS sequences have been produced that extract the crash test waveforms, filter these according to the international standards, and compare maximum accelerations in 3 axes for head and chest accelerometers, with additional rotational accelerations recorded for neck sensors. FAMOS Sequences have also been provided to calculate the Head Injury Criteria (HIC) which finds the maximum of integrated head acceleration during the crash.